No matter how long and hard you have worked to create a secure life for you and your family, today’s economy can take it all away. When faced with financial troubles, you need to know your options in language you can understand. 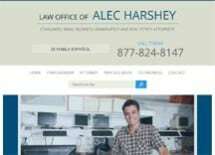 In California, the attorneys at the Law Office of Alec Harshey provide you with compassionate support, solid advice, and expert handling of your needs in bankruptcy and other legal matters. We have over three decades of experience successfully resolving bankruptcy, real estate, small business, and civil litigation issues. We provide customized, individual attention to every client to ensure the best resolution every time. We check and re-check every detail of your case to make sure you are protected. You get the best and most effective outcome without the need for multiple court appearances. We use plain language to clearly explain the legal options in your situation. We empathize with your situation and show concern as we work with you to resolve your issues. We have Spanish-speaking staff available to assist you. The Law Office of Alec Harshey puts service and detail at the forefront for every case we handle. We take the time to talk to you and answer all your questions. We make sure we understand your situation and you understand your legal options. Then we handle your case with the highest degree of professionalism and detail to make sure you get the resolution you seek and deserve.